The appellation of the Côtes de Francs (since 2008 called Francs, Côtes de Bordeaux) owes its reputation to the Thienpont Family who settled in the region after World War II. They own Château Puygueraud, a medieval castle at one of the highest points. Franc is the smallest of the Bordeaux Côtes appellations including just less than 500 hectares of vines with around 50 different producers. It lies east of St. Emilion between the appellations of the Côtes de Castillon and Puisseguin St. Emilion. The region takes its name after the first King of the Franks victory over the Visigoths. Mainly made up of clay and limestone soils in rolling hillsides, Francs makes mainly red wines from Merlot grapes with small amounts of Cabernet Sauvignon, Cabernet Franc, Petit Verdot and Malbec. One wine, Cuvée George, made by Nicolas Thienpont in homage to his father, is made from 45% Malbec grapes. A small amount of white wine (sold under the white Bordeaux appellation) is made from Sauvignon Blanc, Semillon and Muscadelle grapes. The Côtes de Franc makes stylish, rich wines with lots of dense berry fruit and plums, firm structure and good tannic backbone. The quality level is very good across the board and the wines represent very good value for money. Purchased by Georges Thienpont in 1946 and home to his family of 13 children, Puygueraud is a testament to the Thienpont family who put the Côtes de Francs on the Bordeaux wine map. This is a really charming vintage with a dark crimson colour, fresh and spicy nose with wild herb aromas, blueberries and blackcurrants; lovely spice and freshness, on the palate with great persistence. Delicious with lots of life and verve. Super. Very pretty vivid purple colour; appealling nose with crunchy red fruits; smooth on the palate showing good intensity of fruit, acidity and a touch of wild herbs, spicy and nicely oaked on the finish. Very pleasing. A great achievement. 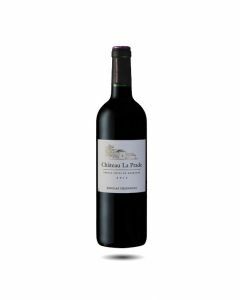 An appealling deep violet colour,very fragrant and spicy on the nose, opulent and round with sumptuous autumn fruit flavours on the palate-a mix of blackberries and boysenberries with a touch of wild herbs; nice spicy finish. One of our favourite wines made by cousin Nicolas Thienpont in the Côtes de Francs; A blend of 85% Merlot and 15% Cabernet Franc grapes grown on limestone soils. The limestone character comes out clearly in the wine. Dark colour with a bright garnet rim; lovely open nose full of wild berry and bramble scents; smooth, fresh and pretty on the palate, this is a lovely wine, well-balanced and pure. This Thienpont family wine, made by Nicolas Thienpont is a blend of 75% Merlot, 20% Cabernet Franc and 5% Malbec. It is intense and structured in the nose with spicy aromas of nutmeg and cloves. There are lovely black fruit flavours on the palate with good intensity and a good tannic structure leading to a rich finish. Deep and bright in colour, the nose is sweet and generous with ripe fruit, notes of cherries and violets at the start, pretty concentration with a touch of minerality and very vibrant. Spicy and firm on the finish with notes of black pepper with a good tannic structure. One of the best buys in the 2015 vintage, this has caught the attention from buyers and press alike. Made from a blend of 80 Merlot, 15% Cabernet Franc and 5% Malbec picked in mid October, this is a bright, dark coloured wine, very pretty and fresh on the nose with lots of personality. On the palate there is lots of dark plums, cedar, liquorice, spice and tannin – all well blended and integrated. Pretty colour and intensity. Ripe and expressive on the nose with a lovely fruity lift and autumn berry aromas. A pretty structure despite the preceptible tannins. Located in Saint Cibard, near the Thienpont family home, Nicolas bought this estate in 2000 on the limestone plateau and this wine always has a note of freshness from this soil. The 2016 is very attractive and perfumed, rich in the nose with a blend of 88% Merlot and 12% Cabernet Franc. There is lots of dense Merlot fruit here, great freshness and personality. A lovely wine with good fruit and spicy intensity.